Step 1 Pour the olive oil into a small saucepan and heat over low heat until warm, about 2 minutes, then remove the saucepan from the heat. Pour the oil into a small nonreactive bowl. Stir in 1 tablespoon thyme, and allow the mixture to cool and steep, at least 30 minutes and up to 24 hours. Step 2 Whisk the vinegar into the cooled thyme-oil mixture until well-blended, then whisk in the mustard, shallot, remaining chopped herbs and salt and pepper. Check the seasoning and adjust to taste. Step 3Place the spinach in a large salad bowl and drizzle the vinaigrette over by spoonfuls, tossing after each addition until the leaves are just slightly glossy with the coating. Pile the salad evenly among 4 chilled plates, and arrange the strawberry slices evenly on top of each. Garnish with strawberry blossoms if available, or with a sprig of fresh thyme. In Recipes-list.com we have selected the most viewed recipes from category - Salads Vegetarian . Enjoy the best recipes specially selected for you! 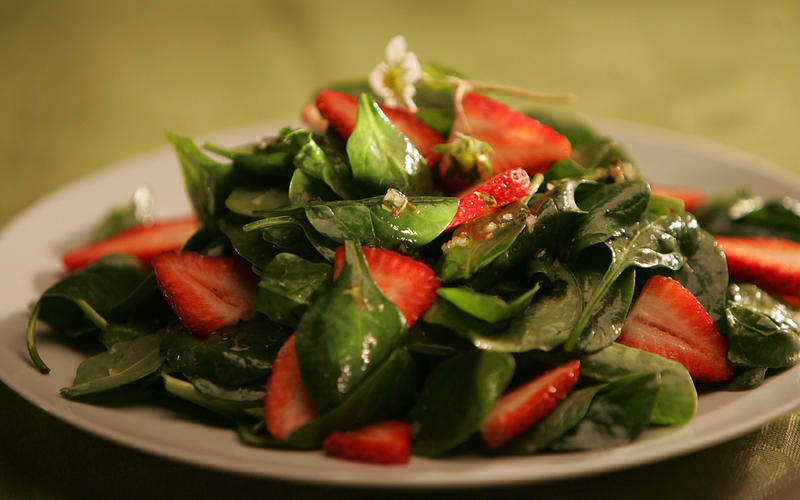 Spinach and strawberry salad with thyme-infused vinaigrette is the right choice that will satisfy all your claims.